SN6629 4031. Dolaucothi (Ogofau) Roman gold mines are located near the village of Pumsaint (five saints), close to the A482 road, 8 miles south-east of Lampeter and 7 miles north-west of Llanwrda. 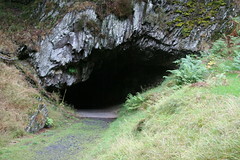 The mines are at the east side of the village beneath the slopes of Allt Gwmhenog on the eastern bank of the river Cothi. The ancient site is on the Dolaucothi Estate and is owned by the National Trust. The first activity here was probably in the Bronze-Age, but the Romans exploited the gold here from the late 1st century AD, and mining was still going on in Medieval times and, even more recently! The Romans started mining gold here when they conquered Wales in the late 1st century AD and probably built a fort close by in 78-80 AD to protect what they saw as a vital asset. The new governor of Britain, Sextus Julius Frontinus, moved to build a number of strategically positioned forts across southern Wales – Coelbren, Pumsaint and Llanio (Bremia) being just three of them – others soon stretched out across the length and breadth of Wales from Caerleon in the south-east to Segontium in the north-west, which in the west were later served by the Roman road, Sarn Helen. The gold was shipped overseas to the mint at Lyons in Gaul and made into coinage that quickly saw its way to the heart of the Roman empire, Rome, and beyond. To begin with opencast surface trenches were dug, but then later deep tunnels were dug down into the solid rock of the hillside of Allt Gwmhenog, some of of which were 50 foot deep and upto 300 feet long, allowing for better access to the gold-seams. But this meant sheer brute strength was needed because the workers were only using simple picks and chisels, which would take many days to excavate just small areas. On the hillside to the north the Romans built aqueducts, one of these being 7 miles long running along a gorge by the river Cothi, while another ran up the valley of the Annell for 4 miles. At intervals there were stone tanks or reservoirs for holding the water – these are still visible along the hillside as are the channels and stone ledges from the foundations of the aqueduct. Evidence suggests that the Romans abandoned the gold mines in the late 3rd century AD, but some form of mining continued in post-Roman times and even in to the Medieval period. In the 1930s a Roman water-wheel was excavated from deep down in the mine, and back in the 18th century a hoard of gold artefacts were found including brooches and snake bracelets. These treasures are now in the British Museum in London. 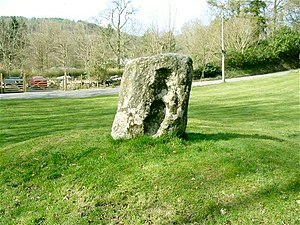 Near the entrance to the Roman mine on a low mound there is a small standing stone (Carreg Pumsaint) which, according to legend, is associated with five Celtic saints who lived as a hermits here in the 6C AD. There names were Ceitho, Celynin, Gwyn, Gwynaro and Gwynog. They were the sons of Cynyr Farfdrwch, a prince of Pembrokeshire, at the time of St David. Legend says the brothers fell asleep in the mine, vowing only to awaken when a truly virtuous bishop is once again seated on the throne of Menevia. Yet another legend claimed they would only awaken when King Arthur returns to Wales. There are said to be five hollows in the stone where the saints lay their heads – although today there only seem to be four hollows in the stone. Long ago there were five healing wells located in the Cothi river at Cwm Cerwyni half a mile south-west of Pumsaint church, each well being dedicated to one of the saints. The wells were at one time a place of pilgrimage. Houlder, Christopher., Wales: An Archaeological Guide – the prehistoric, Roman and early medieval field monuments, Faber, London, 1978. Categories: Ancient Mines, Dolaucothi Roman Mines Pumsaint | Tags: Dolaucothi Roman Mines at Pumsaint in Carmarthenshire | Permalink.